OSLO, Norway, December 7, 2017 (ENS) – The Government of Norway has partnered with the Dutch multinational corporation Unilever to commit US$400 million in public-private funding towards building resilience to climate change in vulnerable countries around the world. The launch announcement was made at the COP23 climate negotiations in Bonn, Germany on Global Climate Action Resilience Day November 14. On that day, leaders in government, business and civil society announced their support for the unlocking of investment in climate resilience measures to benefit societies and safeguard global supply chains. 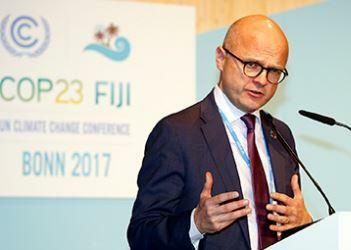 “I am pleased to announce that Norway with Unilever and other partners is setting up a new US$400 million fund to invest in business models that combine investments in high productivity agriculture, smallholder inclusion and forest protection,” Norway’s Minister of Climate and Environment Vidar Helgesen told a COP23 roundtable on building climate resilience. “This should be only one of many new public and private investments in more resilient socioeconomic development,” said Helgesen. Helgesen highlighted the multiple functions of forests, including as biodiversity hosts, vehicles for carbon capture and nature’s cathedrals. Noting that carbon emissions, after declining for the past three years, have resumed increasing in 2017, Helgesen suggested that forests hold a third of the solutions to implementing the Paris Agreement and reforestation efforts should be scaled up. He urged multilateral environmental platforms to strengthen efforts to save remaining forests, and to save the livelihoods of more than one billion forest dwellers who act as custodians of forests worldwide. The new fund was first mentioned at the World Economic Forum in Davos, Switzerland in January. Later this year, the fund will be formally set up and incorporated as an independent legal entity by IDH, the Sustainable Trade Initiative. But now, said Kuijpers, “Big data initiatives, such as the work of Four Twenty Seven, are allowing investors to do this and reduce the climate risks to their portfolios. This is an important step but more is needed to limit climate change risks, increase environmentally responsible investing, and to improve the disclosure of climate risks by companies,” he said. The new fund will invest in meeting the objectives of the Paris Climate Accord, the UN’s 2030 Agenda for Sustainable Development and the Sendai Framework for Disaster Risk Reduction. “The devastating impacts of hurricanes in 2017 contributed to the urgency of the call that cutting greenhouse gas emissions to prevent worse climate change and adapting successfully to existing climate change are not separate objectives but a single goal,” wrote Glenn Leaper, PhD, associate editor and political risk analyst with Nordic Business Media AB. “Climate resilience means three things,” the UN Framework Convention on Climate Change said in a statement about the new fund. “First, people and economies should be able to understand and anticipate climate risks and hazards – extreme events such as hurricanes and long-term changes such as hotter temperatures and sea level rise. 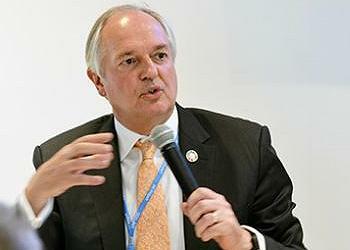 “Achieving economic development and the eradication of poverty can’t be achieved if we don’t build climate resilience. This is why the World Bank is putting resilience, and the management of climate risks, at the heart of its investments,” said Laura Tuck, the World Bank’s vice president for sustainable development. Small island developing states such as Fiji, which hosted the COP23 climate talks in Bonn, are particularly vulnerable to the effects of climate change, such as extreme weather. For instance, Cyclone Winston devastated the Fijian island chain in 2016.